collar (Fig. 421 a). Drawing fold-over collar to the in-depth neckline is based on the drawing shelves after building her neck. segment A1A2. A1A2 = Aa1 = 0.5 cm. The line of the shoulder cut is right for the point A4 on the cut, equal to 2 cm, and put a dot 3.
the Cut of the collar is made of a smooth curve through the points 32, A4, A2, A6. Line the middle of the collar is perpendicular to the line 32And4. On the line of the middle of the collar from point 32 right delayed period, equal to the width of the collar. 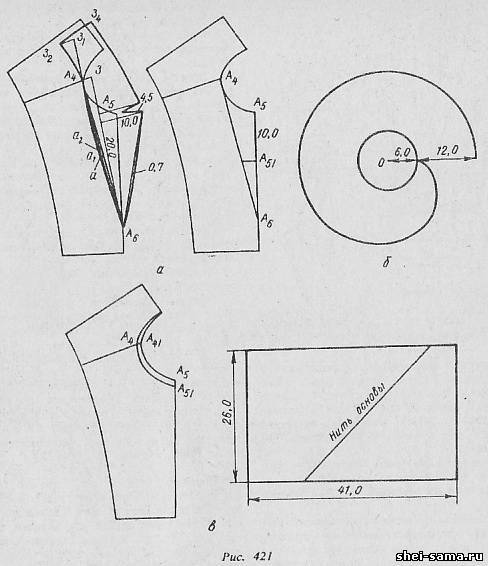 3234 = 8.5 cm Line of departure and ends of the collar is made according to the model. 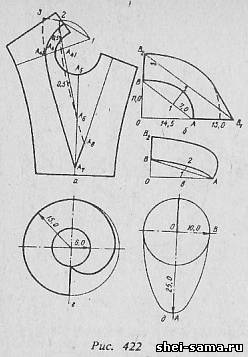 Conical collar (Fig. 421 6). Collars of this type are most appropriate in a fancy dress of thinner material. Inner line of the collar is a part of a circle whose length is equal to the length of the neck. Point O with radius 6 cm is the circumference. Parallel to these lines at a distance of 12 cm (width of collar) is the second line, which ends at the initial point. A cowl neckline (Fig. 421). Collar designed to vrachevanie in-depth neckline. drawing of the collar is a rectangle, whose length is equal to the length of the neck shelves and back. Collar length is 41 cm Width of collar is 26 cm warp yarn in the collar is at an angle of 45 ° to the line of his middle. Collar beyka (Fig. 422 a). From the point A4 to the left of the line of the shoulder cut is the cut of 3 cm, a dot A42. From the point A4 to the right on the continuation of the shoulder cut is the cut is 2 cm, a dot A41. cut Length And42a 3 is equal to the length of the neck backless. Turn-down collar dresses with zipper top (Fig. 422 b). Design drawing standing-the fold-over collar it is advisable to build out the product drawing. Builds a right angle with the vertex at point O. From point O up is delayed a period equal to 11 cm, a dot B. point On the right is delayed a period equal to 14.5 cm, is point A. Points A, connected with a straight line. From point A in a straight line is the segment that is 7 cm, put a dot 1. From point 1 is restored to the perpendicular, on which is deposited 5 cm, a dot 2. Point 2, And connect a smooth line. turn down collar in the middle (Fig. 422). Builds a right angle with the vertex at point O. From point O up is the cut that determines the height of the rack in the middle, put a dot V. S = 5 cm. Point To the right is an arc, the intersection of which with the horizontal side of a right angle is indicated by the point A. AB is equal to the sum of the lengths of the neck of the back and shelves. Points In and And connected with a straight line. A segment AB is divided in half. The perpendicular from the midpoint of segment AB is equal to 1.5 cm 1 - 2 = 1.5 cm Up from the point In the delayed cut BB equal 7 see Form the front end is determined by the model. In women's clothing for decoration are widely used such details as kokila, frill (Fig. 422 g, d). Kokila attached to the middle of the front around the circumference of the smaller radius. Frill can be removable or stachivaya in the neck.